I was there that day as an independent journalist taking many photographs for my series of articles for Pacific and international media. One person who really stood out was the little girl with the beautiful smile. But I never knew her name back then. 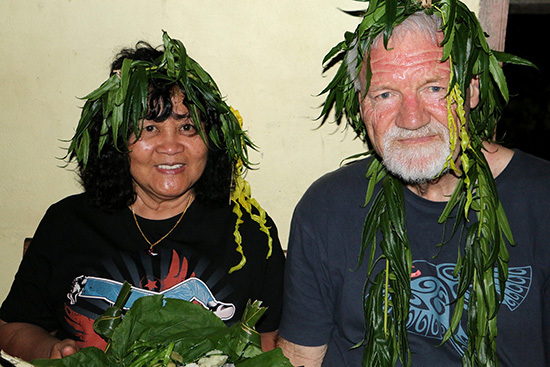 Thirty-three years have passed since then and my wife, Del Abcede, and I have just visited Aneityum (“Atomic”) Island in Vanuatu this week to meet that girl – June Keitadi and her family. She is now June Warigini, mother of three, grandmother and a Salvation Army volunteer living on her home island. And she still has that stunning smile. I wanted to present her with a copy of my 2014 book, Don’t Spoil My beautiful Face, that was inspired by her and she is featured on the cover. Not only June, her mother Annie Keitadi is featured there too. 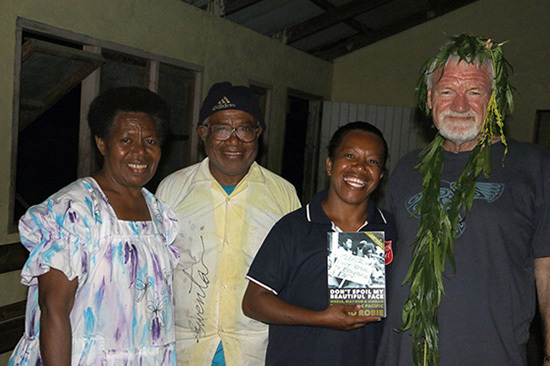 Her father, Jack Keitadi, was deputy curator of the Vanuatu Kaljoral Senta at the time and he later became curator. It was a delight and a privilege for Del and me to be able to visit the family on Aneityum and to be treated to a “royal” welcome by the community and tribe. June remembers that day in 1983 really well. It left a deep impression on her in later life. “They wanted someone young who could go on their behalf to the French Embassy and present a petition calling on France to halt its nuclear tests in the Pacific – so they chose me,” she recalls. She remembers her toothless smile was regarded as symbolic of the ravages of nuclear testing in the Pacific, not only by France, but also the United States and Britain. Faced with persistent protests in the Pacific, France eventually ended all nuclear testing in 1996, thirteen years after that rally. But the campaign for full compensation for the victims of nuclear testing continues. June feels that her experience at that young age helped give her an inner strength for the challenges of life today and inspiring her in her desire to help others in her church work. Ironically, both Del and I met her by chance on Christmas Day at the end of last year, but had no idea at that time of her connection with my book. While visiting Aneityum for a day, we shared in an “olden days” traditional food and customs exposure in a model 18th century village on the island. We realised that the guide “June” we had met that day on the island was indeed June Keitadi now Warigini. Aneityum, the southernmost island in Vanuatu, currently has a population of 1740. It is not part of Vanuatu’s electricity grid and islanders rely on solar power. The island has no cars, or even a road. The air connection is only two return flights a week from the Tafea provincial capital on Tanna. There is also no doctor, although a dispensary is now operating with two nurses and a midwife. On the other hand, for visitors like ourselves, island life seems idyllic, a byword for “paradise”. Aneityum has a wonderful healthy lifestyle for youngsters, remote from the world’s conflicts and problems. There are three primary schools and a boarding secondary school – one that attracts students from other outer islands whose parents want an education where the traditional way of life is important and free from the urban ills of Port Vila. June is assistant bursar at Teruja secondary school. She tells a delightful story about a recent excursion for students from Aneityum who went on a “field trip” adventure by island cargo ship to Tanna to visit the famous Mt Yasur volcano. The island’s micro economy is self-sustaining and is augmented by occasional cruise ship visits and tourism days on Mystery Island. It appears that Aneityum is remote from government services or assistance and the support of cruise shipping companies, such as P&O, is crucial for the islanders.